As many of you may know, Rockford’s annual Make It “N” Take It Scarecrow Building Festival is growing. It takes place over two weekends this fall on Saturday and Sunday, September 29 and 30 and October 6 and 7. 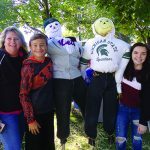 This year the goal is to have 2000 scarecrows built by people from all over the state and even the Midwest to make this event the largest scarecrow building event of its type in the country. This is a lofty goal considering that last year 836 scarecrows were built over three weekends. 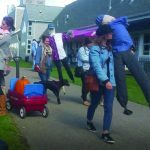 Dedicated volunteers have been working since late last year to prepare the sewn heads, the stick frames, the twine bundles, and to plan the publicity in newspapers, on social media and on TV and radio that is needed to make the effort successful. 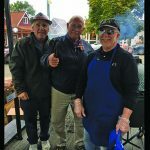 With all that happening, organizers still have one very serious concern – having enough volunteers to handle the event effectively. This huge project can’t be completed without the community’s support. There will be something tha almost anyone from middle school students through senior citizens can do to help. 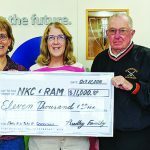 All proceeds benefit North Kent Connect and the Rockford Area Museum. Both of these non-profit groups depend heavily on donations and fund raisers like this event. • BUSINESSES: Mobilize a group of employees to help. • CHURCHES: Individuals can help and also consider having youth, young adult, senior, and other groups to help. Their effort will provide a service to two deserving causes. • SCHOOLS: Groups of parents or staff members could lend a hand. Middle and High School student groups can also make a meaningful time contribution. • CIVIC AND SERVICE ORGANIZATIONS: If your members could find a few hours to help it would mean a lot. • INDIVIDUALS: Please consider spending just a few hours to help out. Talk to your neighbors. Come as a group and have a ball. 2. Click the button that says “SIGN UP FOR FUN HERE” to go to where available dates and times are listed. 3. Pick your time, sign up as directed and you are all set. People representing groups of volunteers can call Al Pratt at 616 485-4144 or send an email to rockfordscarecrows@hotmail.com. We’ll get back to you to get you set up. We would also be happy to meet with your group to answer any questions and hopefully enlist your help. Groups and individuals: this can’t succeed without your help. Please don’t hesitate. We need you now! On behalf of North Kent Connect and the Rockford Area Museum, thank you in advance for your support.